“Attracting global investment is not all about the money,” believes Steffen Larsen, Vice President for Products at Zwipe, one of Norway’s rising fintech stars. Steffen spoke at a workshop on how to attract global fintech investment hosted by Fintech Mundi during Oslo Fintech Week. Zwipe which has developed the world’s first fingerprint authenticated payment card, closed a $5 million series B funding round in the fall of 2015 from Photon Future, a subsidiary of the Chinese technology giant Kuang-Chi Group. To date Zwipe has raised over $10 million in funding, which according to Larsen, required serious attention to building a robust network, utilizing door openers and establishing superior resources and vehicles for commercialization. Sharing the podium was Ronald Eriksen, Chairman of Prego International, an international fintech with a solution that offers everyday banking for the unbanked. Launching in Malaysia and with additional hubs in the Nordics and the UK, Prego has secured in excess of $7 million from global investors and the immediate plan is for an IPO on the Oslo Stock Exchange. Bo Ji, chief representative for Europe at CKGSB introduced the audience to China Start, a leading Chinese investment programme scouting promising Western start-ups. 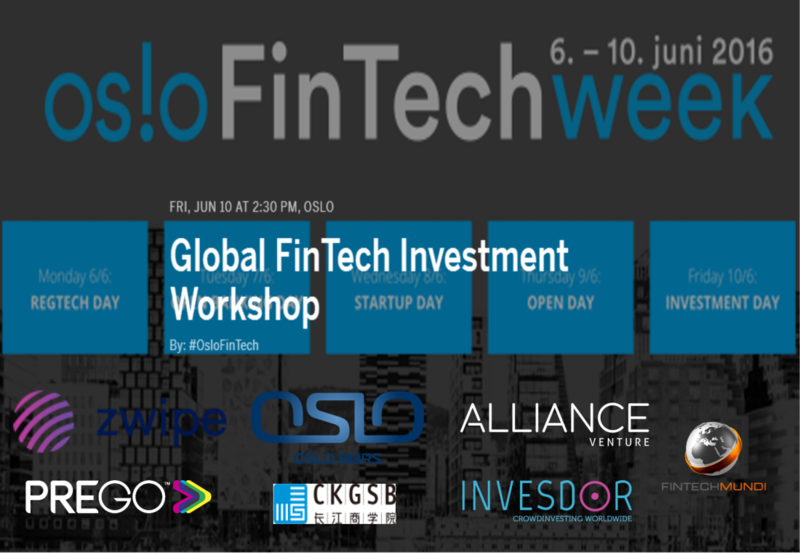 For more information about the programme and its series of planned events, contact Susanne Hannestad at Susanne.hannestad@fintechmundi.com. The workshop concluded with a panel discussion that included Øivind Amundsen, EVP at Oslo Stock Exchange, Jan-Erik Hareid, Managing Partner at Alliance Ventures, Tero Weckroth, Chairman at Invesdor in addition to Steffen Larsen, Ronald Eriksen and Bo Ji. The discussion was moderated by Susanne Hannestad, CEO of Fintech Mundi.